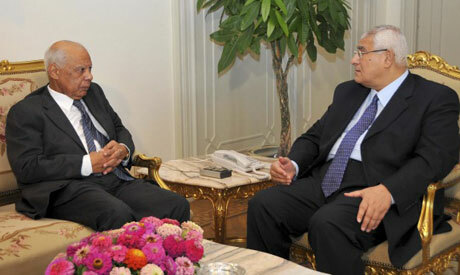 Ministers of the new cabinet, headed by PM Hazem El-Beblawi, have been sworn in in front of interim president Adly Mansour at the presidential palace on Monday afternoon. This piece was amended on Tuesday 16 July; the minister of petroleum was originally named as Mohamed Shoeib. AS the coup conspirators consolidate power by sharing the spoils of the takeover, they have without feeling of slightest shame and illegally imprisoned the elected President Morsi and leaders of MB with dubious charges and also on excuse for the maintenance of order. General Al Sisi receives his reward by being promoted to a Deputy Prime Minister. On the streets, protests by MB is increasing in intensity with signs of greater escalation. Hence, the immoral actions of this illegal regime will have to intensify by brutal crackdown on protests and mass arrests of more leaders with the aim of paralyzing the MB. If they fail to bring down MB, then it will be the end of this regime and its sponsor and see the rise of Brotherhood again. Whatever is the outcome, it will be the most painful episode of Egyptian history. Blame it on the Heads of Government Institutions, the judiciary, the Police, the mass media and the most important institution, the Military. Maybe also it will be the end of political life for the Armed Forces. Laila Rashed Iskander, new minister of environment, is an excellent choice. This is National unity Government, Conglatulations. Highly accepted and supported.IT is well.thank you. Sisi deputy prime minster ? Defece Minster ? Army Boss ? Appoints President ? Where does Pharoe theory of Baradei fits in this ? President who can only speak through spokes person is a president,parliament,Shura Council and judiciary ? where is the mind of the educated liberal minds? at least the "un-educated" of MB refuse to accept this fiasco..